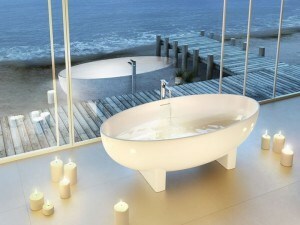 If you’re looking for a contemporary bathroom you don’t need masses of space or a huge budget to create the wow factor. Here are some tips on creating a contemporary bathroom. Create a focal point for the room with a free-standing bath. If you don’t have the space use a picture tile or an amazing piece of bathroom furniture, something that really stands out. Use this focal point to build the rest of the bathroom around. Clearwater do a great range of free-standing baths and are of the highest quality. Use a Toilet and Basin that are simple and un-complicated. If possible use products that hide the pipe-work. Do this by using a wall hung toilet or alternatively a flush fit WC. 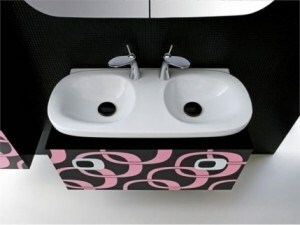 For the basin use a semi-pedestal or a vanity unit. The Laufen Mimo pictured below is a great idea, it has a vanity unit that can be used as a focal point and the basin is really clean especially as the overflow is built in and not visible. Keep the lines the same if you select a bath that has straight lines make sure you select a suite, taps & shower that have the same. Keep the walls and floor straight forward. Use plain tiles on the walls and floor. Alternatively use a wooden floor with and a feature wall and the rest of the room in a neutral colour. A shower is one of the main pieces of equipment in a bathroom it has to be functional yet aesthetically pleasing. Use a concealed valve with a large shower head coming out of the wall or ceiling. However my favourite is a digital shower it ticks all the boxes as far as contemporary is concerned. They’re cutting edge and look good. Aqualisa do a great range including a bath filler and if water pressure is a problem a pumped version is also available. Use stand out colours for finishing touches to your bathroom. If you’ve kept the walls all the same colour and neutral choose towels and ornaments that stand out. If you’ve gone for a focal piece of furniture or tile get towels to match the colour. 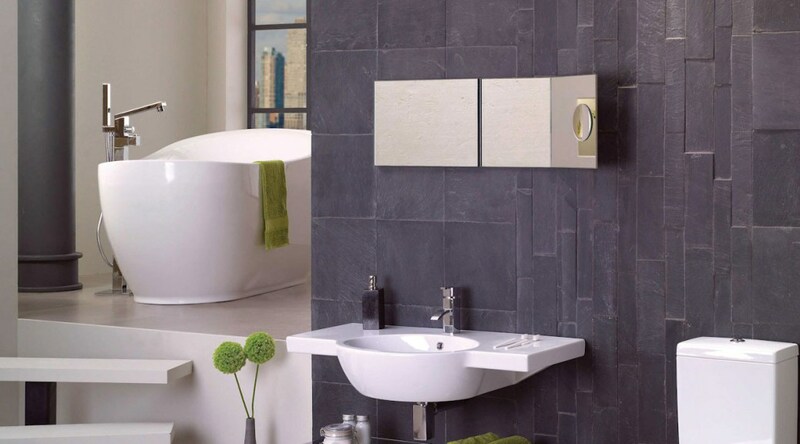 See an example of one of our contemporary bathroom displays below. Good luck with your contemporary bathroom project. 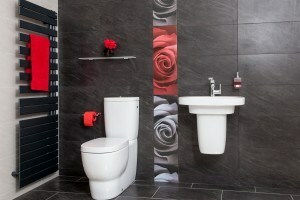 Here’s an example of one of our bathroom sets using a red floral tile as the centre piece. Tiles – Schwarz Rebe & Grau Rebe, Petals Red & Black.